Charlotte LOVES smoked salmon cheese cake. Go figure. She licked and sucked her spoon as if it were a lollipop. 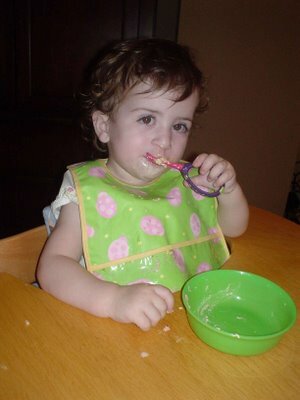 For a kid who doesn’t eat, we sure do get a lot of pictures of her eating. Tee hee. On smoked salmon cheesecake: The recipe is by Jeff Nathan, my sister’s neighbor and friend, from his book Adventures in Jewish Cooking. As most of you know, I like my bacon cheeseburgers too much to keep Kosher, but with Jeff’s two cookbooks, I’ve been doing a LOT of kosher-style cooking recently. The cheesecake can be cut into one-inch squares and frozen.